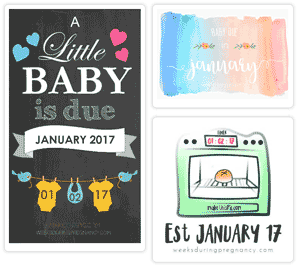 Save, share and announce your due date with our pregnancy announcement designs. If you're ready to announce your pregnancy this calculator is for you. 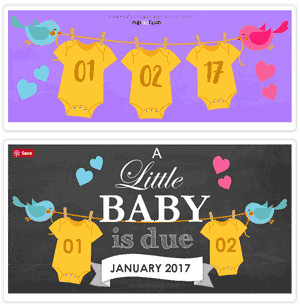 Enter your due date and the calculator will create an assortment of announcement images specifically for your due date. To get your own announcement image, enter your due date into the form at the top of the page. Who do you want to tell first? Straight away: If you're super excited and want to tell some people or even everyone you know, then go for it! On the other hand, it can worth considering the advantages of waiting a little longer. 4 to 8 Weeks: Once you know you're pregnant, you will probably be at least 4 Weeks' pregnant. Any time from now on can be a good time to tell parents and friends. However, unless you swear people to secrecy, news travels fast so you may prefer to wait until you're ready to let everyone know. 12 Weeks: 12 Weeks' pregnant is the traditional time for making pregnancy announcements. If you haven't already told close family and friends, this is a good time to let them know, and to tell anyone else who doesn't already know, for example, people outside your immediate circle of family and friends - your boss, work colleagues, extended family, and other acquaintances. Reduced miscarriage risk after 12 weeks: 12 Weeks' pregnant is your first major pregnancy milestone. The embryo has developed its major organs and body structures and is now officially a fetus (10 weeks since conception). At this point the risk of miscarriage has dropped and women commonly feel ready to share their good news. Unlike your general pregnancy announcement, which you can do in your own time, it is normally recommended that women visit their doctor or obstetrician soon after they know they are pregnant. While some doctors recommend a first visit at 8 Weeks' pregnant, it is never too soon to contact your health care practitioner to discuss and arrange your first appointment.